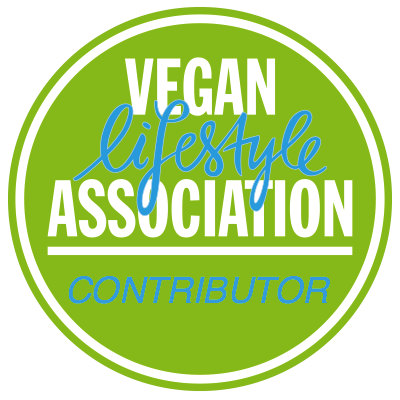 I was delighted when Chantal asked if I wanted to review the vegan Bounce energy balls as part of the vegan lifestyle association. 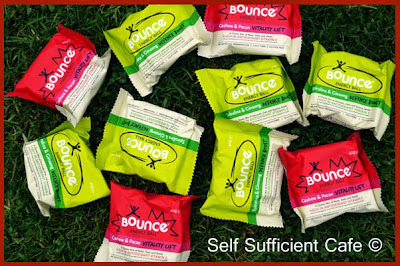 I already knew I liked the Spirulina Bounce (the green one) but I was blown away by the Cashew and Pecan Bounce (the red one). In total there are 7 varieties but unfortunately only 2 are vegan, obviously I haven't tried the 5 non vegan energy balls but the two I have tried are utterly delicious! According to their website the Spirulina and Ginseng energy bar was designed to give you a lift at any time of the day. "It's a delicious, chewy mix of almonds, oats and sesame seeds, combined with the superfoods, spirulina and ginseng". 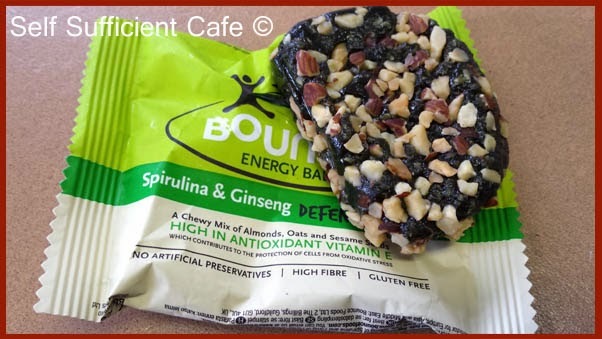 You can really taste the almonds, a comforting marzipan roundness paired with the nutritious spirulina is a match made in heaven. These energy balls will definitely satisfy your hunger craving. They are high in Vitamin B12 and fibre and the calorie total? 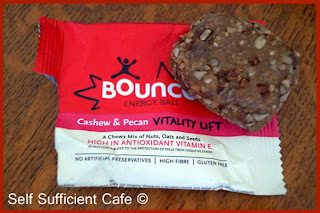 191 calories, which sounds a lot but you will not be hungry after this energy ball! This energy ball is my new favourite, which I didn't think was possible as I loved the Spirulina & Ginseng energy ball. These will also satisfy your hunger craving and are high in vitamin E and fibre and the calorie total? 195 calories. Both energy balls are also gluten free. If you haven't tried them then you must treat yourself as they are fabulous. You can purchase them from Holland and Barrett, Waitrose, Tesco Extra and Boots to name a few. Or if you want to buy a full box head over their website and there is a special offer on at the moment. If you buy 1 pack of the Cashew and Pecan energy balls (12 in a pack) you get another pack free! So that's 24 energy balls for £19.45, about 81p each! 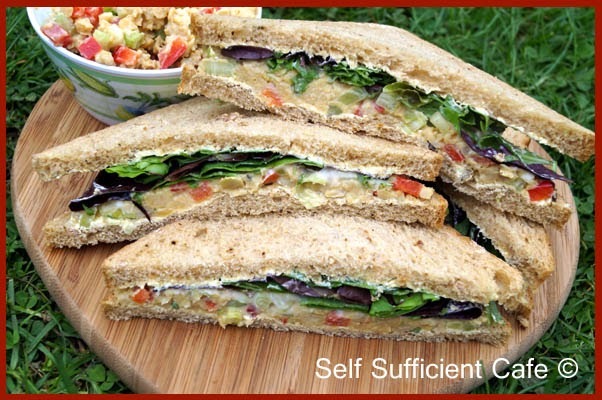 I thought if Summer isn't coming to me I'll go to Summer and I set to in my kitchen to make a summery sandwich spread. Before I transferred to a vegan lifestyle I used to love the Mediterranean Cheese Sandwiches I could buy at work. You can't get more summery than the Mediterranean can you so I thought I would try a vegan version. I was very impressed with this spread and I'll even go as far as saying that it beat the Mediterranean Cheese Sandwiches from work - hands down! 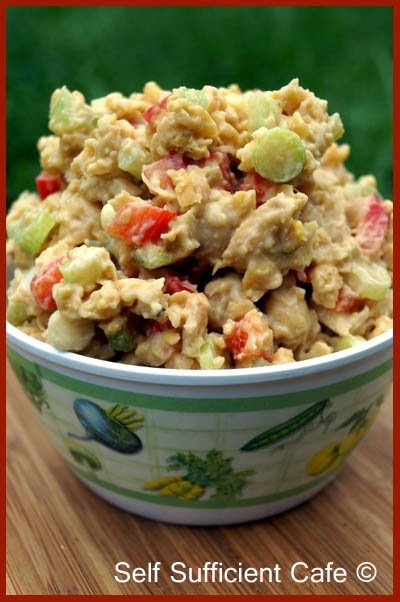 These are far more healthy too even if they do use a little vegan mayonnaise. 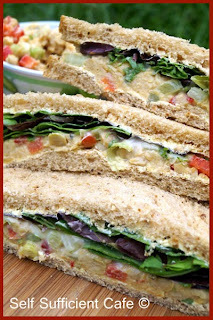 The spread can be made in minutes and it will easily feed 4 hungry people in some form of sandwich. 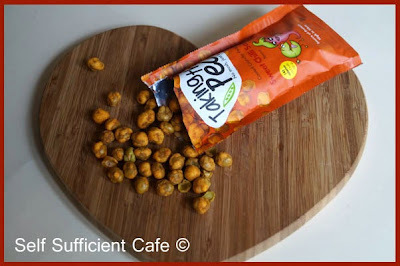 Rinse the chick peas well with cold water and pat dry. Transfer to a bowl and mash with a fork. 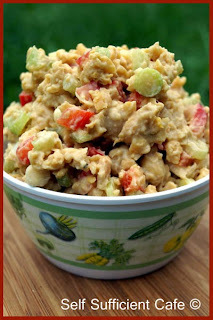 Add the red pepper, celery, spring onions and nutritional yeast and mix until well combined. Add the salt and pepper to taste. Finally add the mayonnaise and fold through the mixture. Use the mixture to spread onto bread to make sandwiches or spread onto flour tortillas to make wraps. You can add more vegetables if you like and the spread would go further but I liked the ratio above, just enough to taste the summer! 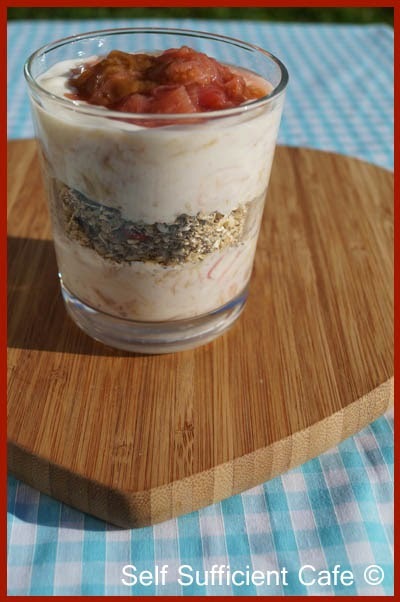 I promised you a rhubarb recipe and here it is; Rhubarb Syllabub, well, my take on it anyhow. This is not a heavy creamed dessert, although you could eat it for dessert but more of a fruity breakfast. It's also perfect for people on the go as it is easily packaged up to take with you. I've always roasted my rhubarb rather than stewing it as it always tends to hold its shape a little better. The rhubarb I have grown isn't that tart so my dish didn't need much sugar, but feel free to add more if you feel it is necessary. Have you tried the Alpro Soya yoghurt with almonds yet? Oh my, it is absolutely delicious, and it is the perfect yoghurt to use for this dish. 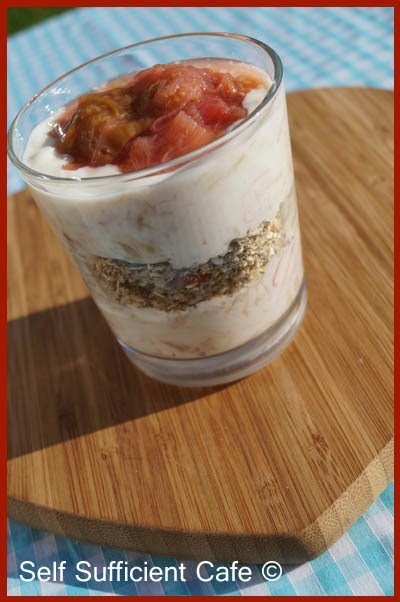 Mix the yoghurt with 3 Tbsp of the stewed rhubarb and place half of the mixture in a glass. 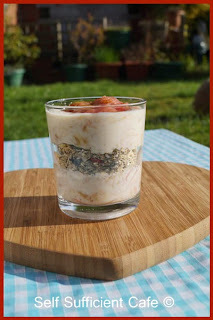 Sprinkle over the homemade muesli and top with the remaining yoghurt and rhubarb mixture. Add the rest of the rhubarb to the top and enjoy. Delicious even if I do say so myself! I've been enjoying this for breakfast for the last 2 weeks and I haven't tired of it yet! Cut the rhubarb into 3cm pieces and toss into an oven proof dish. Add the grated ginger to the grapefruit juice and stir. Pour over the rhubarb. Sprinkle over the sugar and roast in a moderate oven for 20-30 minutes or until the rhubarb is cooked but still holding its shape. Leave to cool, and store in the fridge ready for your breakfast for the week ahead. 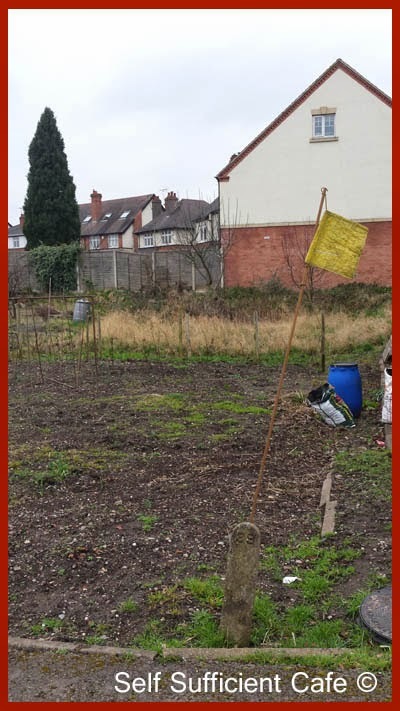 Notice Board: I've got an allotment! So, its been almost 2 weeks since I last posted and even longer since I posted a recipe! Why? Well, I haven't been home much! 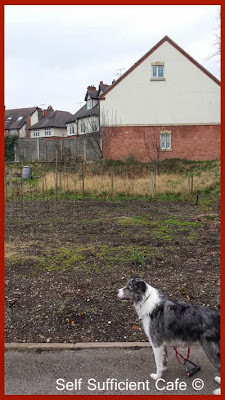 You see, I've gone and got myself an allotment, and I am bloomin' loving it! Don't get me wrong its hard work, in fact very hard work! But I am hoping that all my efforts will be rewarded with all that produce I'll be able to harvest. I've been growing fruit, vegetables and herbs for years now but I had over grown my small back garden and there is only so many pots you can place on a patio before there is no space for a garden chair! The allotment is in walking distance from my house, about 1½ miles away, which is great for an evening stroll with Marco, to check on my veggie babies before dark. Weekends just zoom by too, before you know it 5 hours has passed and I haven't even stopped for a bite to eat. Another plus is that all that calorie burning digging means that my winter weight is finally shifting! Yes, every year I pile on the pounds during the winter months. I'm sure deep down I think I'm going to hibernate and therefore tend to eat more! But come summer, when the nights are lighter and I exercise more the weight does come off, but the older I get the harder it is! Ageing is so cruel at times ha ha ha. My plot is huge! Yes huge! In fact my allotment next door neighbour joked last weekend that I needed to put an advert in the local paper for pickers! I'm hoping that my produce will last me through the winter and I won't have to spend so much on shopping. Is it just me or has anyone else noticed that the price of food has shot up! So, what am I growing? This season anything I can fit on the plot ! I'm testing out the soil and seeing what grows well so I can plan better next year. Unfortunately I hadn't grown any seedlings before I got the plot so I was a little behind. Besides before I could grow anything my plot needed a lot of work and that included a lot of digging! My plot is almost in two halves, the front half has been dug over before and last season even had a few potatoes growing apparently. But the back half has not been used for what seems like a lifetime. It is extremely uneven and full of couch grass. Put it this way, when exploring it I fell over a few times as the ground was so uneven, I was lucky not to sprain my ankles! Even Marco doesn't go and explore. However, the back half has got a little treasure in the form of 2 apple trees, 1 cooker and the other an eating apple, so it will be well worth the effort of clearing the ground, maybe I could turn it into a little orchard? 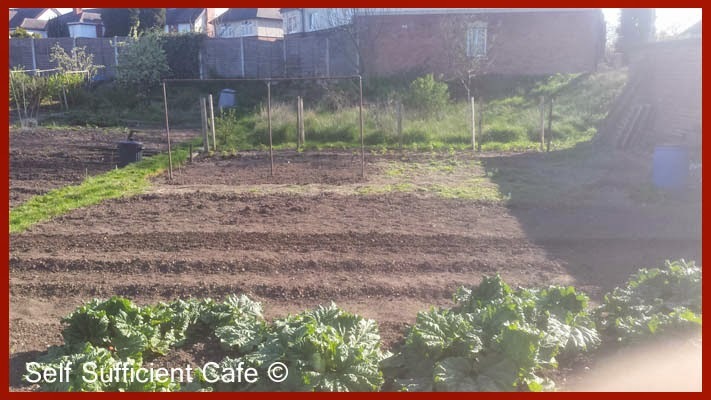 I also had another gem on my plot, growing at the very front was rhubarb and I seriously can't believe how quickly this stuff grows! On my first day I spotted little pink stems breaking through the soil, you can only just see them in the second photo above, just to the left of Marco's head. By my second visit only 1 week later they had grown so much, you can see in the photo above, in total I think I counted 12 plants, enough rhubarb to see me through spring I thought! The next week they had grown even more! I've been enjoying roasted rhubarb for breakfast ever since, recipe will be posted soon! I've never been one to do a lot of digging, as my veggie plots in my back garden were in the form of raised beds, which don't need digging as such. The down side being that some vegetables (like cauliflower) don't like the loose soil. I wasn't quite sure how I would get on with digging, but I actually think it is the BEST exercise in the world! That's me in the picture to the left, it didn't take long to dig the area you see and if you're ever stressed out then digging is for you! 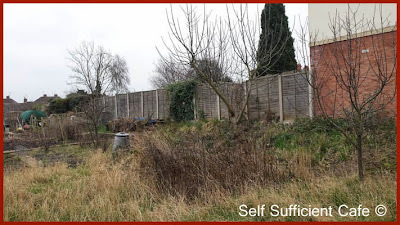 While I'm down the allotment I completely forget about the outside world, I lose myself completely and even though its hard work, I leave feeling re-energised. It must be all that vitamin D I'm getting! Marco loves it down there too, our weekends now consist of an hours walk over the fields chasing his ball, followed by a cup of tea and slice of toast, which we share. After breakfast I load my hubbies truck with garden equipment, snacks and a big bottle of water for me & one for Marco and then we spend the day down on the allotment. 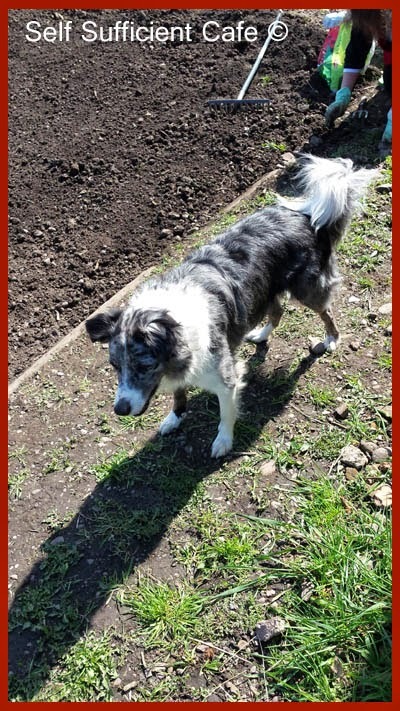 Marco gets spoilt rotten, everyone on the allotment knows him already and they always come down and give him a fuss. He's even be known to get a few treats, and he knows which people have the treats in their pockets! He can sniff out a carrot or a piece of cucumber for miles! I'll have to teach him how to dig, so he can help plant my vegetables. 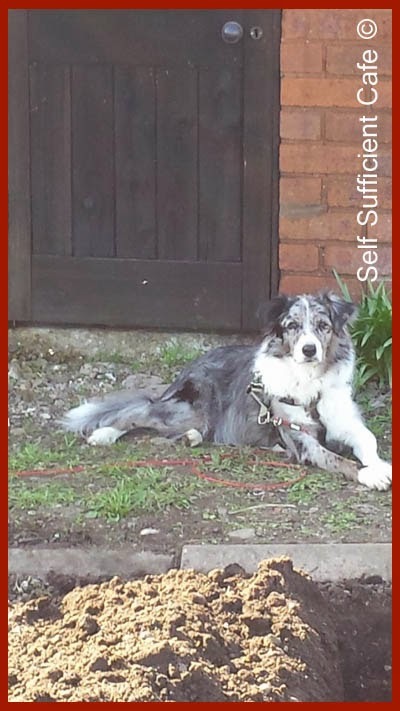 If he's not getting fussed from the many friends he has made down there, he's watching the birds flying around or landing on freshly dug soil looking for worms. Otherwise he's just chilling enjoying being in the fresh air. 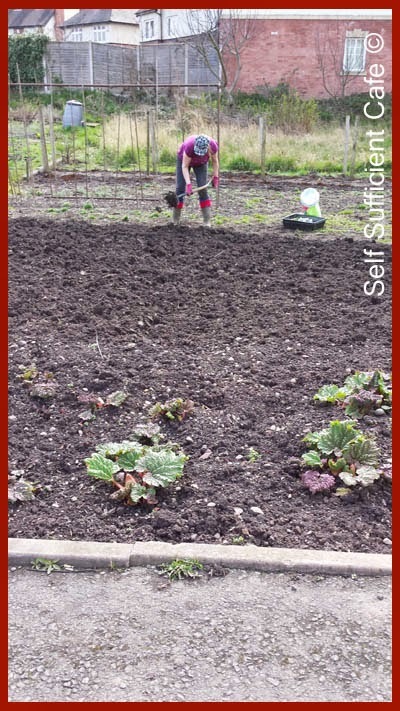 So far I have 2 rows of potatoes (earlies), 2 rows of onions, 1 row of shallots, 2 rows of carrots (1 purple variety), spring onions, a broad bean patch, a runner bean patch, a strawberry patch and 2 rows of autumn raspberries, blackcurrent and gooseberry bushes, plus the rhubarb and the 2 apple trees! 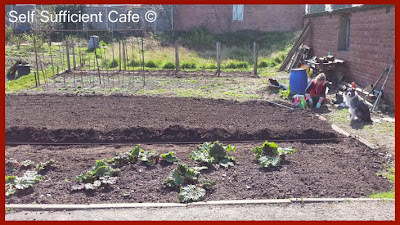 Since getting the allotment I have been busy sowing seed too and I also plan to grow sweetcorn, French beans, courgettes, pumpkins, cauliflower, kale, Brussels sprout, purple sprouting broccoli and calabrese. In the picture to the right you can see the start of my very first potato trench I dug, exciting times! 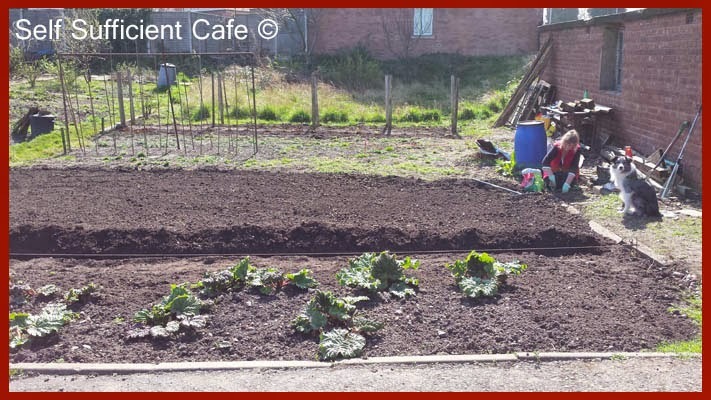 So, now you will understand why I have been absent from my blog for a while, but now I'm on top of the digging and planting to date I will be posting some recipes for you soon. The first being a delicious rhubarb recipe of course. I thought I would leave you with a photo of Marco who is also wiped out after a weekend of walking and being down the allotment. He fell asleep in my arms and his little mouth was open enough to hear a little snore. 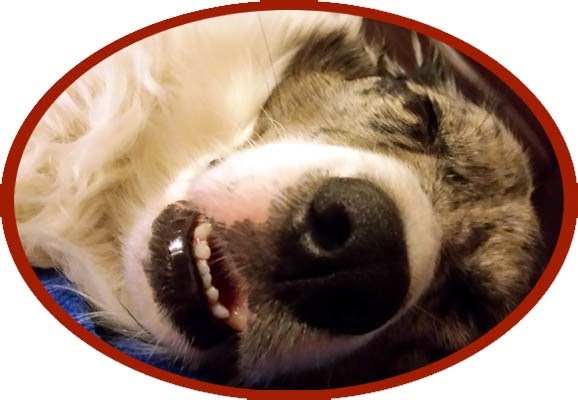 Every now and again his paw would twitch like he was chasing something in his dreams, bless him. 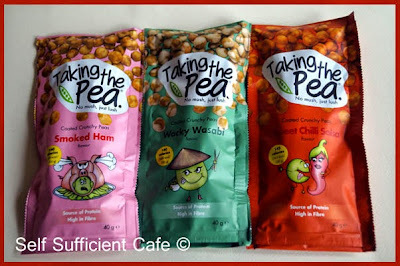 A while back I got sent three snack packs to review of a new snack food called "Taking the Pea". Taking The Pea was launched earlier this year by Mike, an Aussie living in London who hated peas! That long term hatred of peas was turned around when he tried his first Wasabi pea and things have just grown from there, literally! 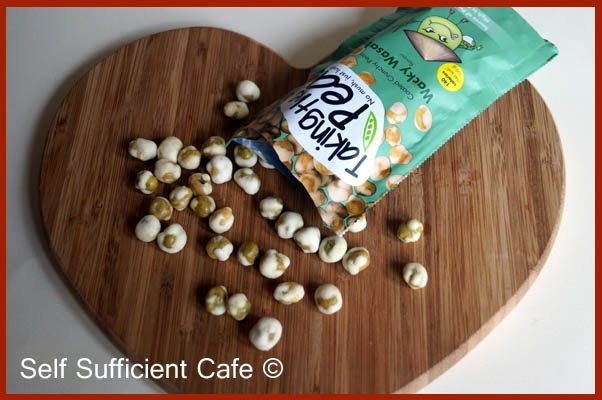 The Taking the Pea snacks use home-grown green marrowfat peas which have been seasoned with vegetarian friendly ingredients and there are 4 flavours to try. At the moment only three flavours are vegan friendly; Sweet Chilli Salsa, Smoked Ham, and Wacky Wasabi but I am told that Mike is working on making the 4th flavour vegan too; Cheesy Peasy & Onion, now wouldn't that be something! I love their mission statement "Give peas a chance! Be active, be healthy whilst "Taking the Pea". Each pack is one portion so you don't have to worry about eating more than you should, but heh! Each pack is under 145 calories and there's a hell of a lot of those crunchy peas in each snack pack! Stockists are growing all the time and they have been included in the Vegan Tuck Box and spoiler alert.......... a little birdie tells me a packet is also included in The Vegan Kind Monthly box, so if you subscribe to TVK you'll be sure to be able to try a packet for sure soon! If you can't wait head on over to there website where you can order from them directly. In fact they have a rather cool website you should check it out! The first flavour I couldn't wait to get my hands on was the Sweet Chilli Salsa, I just love sweet chilli sauce! The next flavour to try was of course the wacky wasabi, I'd tried other wasabi peas before so I knew what I was letting myself in for! The final flavour I was most curious to try but at the same time almost reluctant. I don't tend to eat fake meats and I never eat meat flavoured crisps even if they are vegan. But I thought no I'll take one for the team and give it a try. OMG! I'm converted! I just loved the Smoked Ham flavour, which is really strange for me to type! Thankfully for me it didn't cast me back to almost 30 years ago when I did eat meat, it didn't remind me of ham at all, probably thanks to the crunchy texture of the pea. It reminded me of smokey BBQ food and gave you that smokey flavour without the meaty taste, it was utterly fantastic! Mike, you've won me over with this flavour - I didn't even share any of the peas, I just kept making yum noises! Ha ha ha What's more I didn't even take a photograph of the peas once the packet was opened! The other two flavours were also good, the wacky wasabi wasn't over powering like some other wasabi peas I have tried, it just gave your mouth a nice hum, if you know what I mean? I'm just hoping that the Smoked Ham flavour is the packet that's in my TVK box winging its way to me as I type! I decided to compile a second series called "Spring into Action", which is all about healthy food that can be on your plate in a matter of minutes! Lets face it, with the nights staying lighter for longer who has the time to stand in the kitchen for hours on end preparing your meals, if you're like me you want to make the most of those lighter nights! 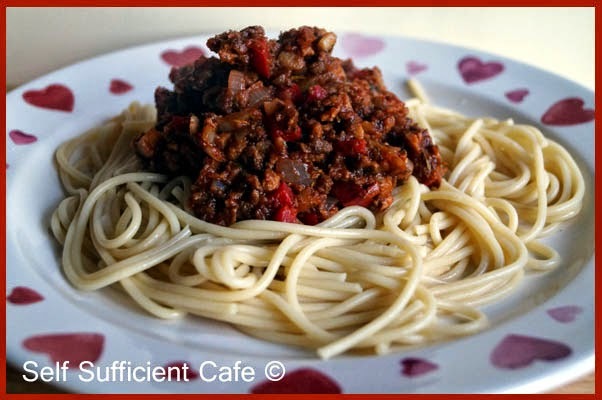 My first super quick recipe I'm going to share with you is my Speedy Spaghetti No Bolognaise, its a tweak on a previous recipe I posted, but I keep going back to this recipe time and time again when I'm short on time. 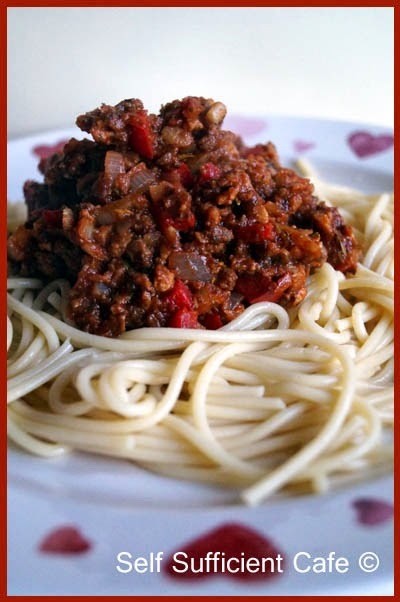 Boil your kettle and pour the hot water over the spaghetti in a large pan. Turn on the heat and push the spaghetti so it is all under the water. Once it starts simmering give the spaghetti a quick stir. Cook as per packet instructions and drain. Whilst your spaghetti is cooking make the "No Bolognaise" sauce. First sauté the onion in the olive oil for 3 minutes, then add the garlic and sauté for a further minute, stirring all the time. Next add the red pepper and sauté for another 2 minutes adding a splash of water if the vegetables start sticking to the pan. Add the soya mince to the pan and stir so all ingredients are mixed well. Stir in the tomato passata and bring to a simmer, about 3 minutes. Add the remaining ingredients and stir in, simmer for another 6 minutes or until the vegetables are cooked. 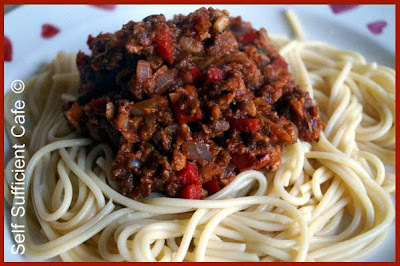 Dish out the spaghetti onto plates and top with the "No Bolognaise" sauce.